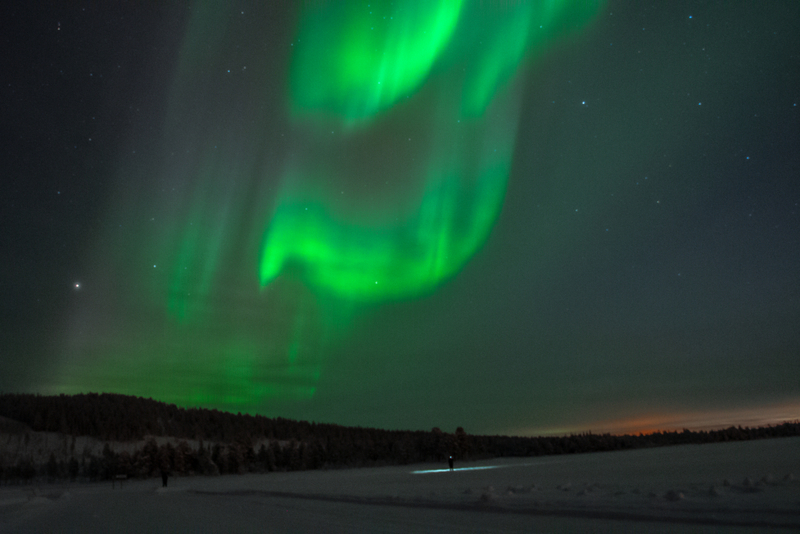 The town of Arjeplog in the northern reaches of Sweden is like no other on earth. This is a place that was practically willed into existence by an automotive industry hell bent on making their vehicles safer. With temperatures frequently dropping below minus 30 degrees centigrade throughout the winter months and a surplus of frozen lakes, it quickly became obvious to a couple of visiting Opel engineers back in the late 1960s that this was the perfect place to test a car’s performance when the conditions get slippery. Things like anti-lock brakes, traction control and winter tyre treads were all developed here and as a result the small town’s tiny population practically doubles when the mercury plunges. But a quick scan of the nearby Arvidsjaur airport reveals that vehicular boffins and snow-loving engineers aren’t the only ones here to make the most of the frozen wastelands, because several companies now offer the full ice driving experience to paying punters. Few are as luxurious or all-encompassing as the week-long drifting extravaganza offered by Jaguar, which is limited to just a few places on each rotation but offers and in-depth look at how to handle a car in some of the most treacherous driving conditions. 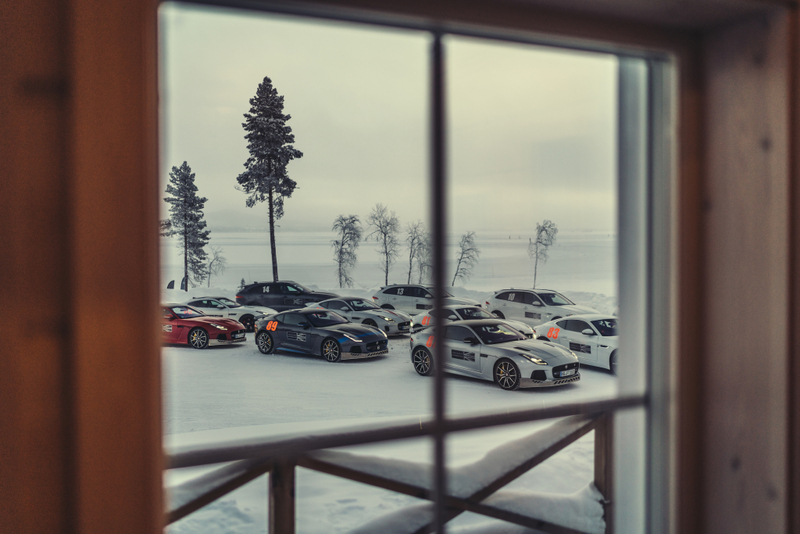 After a short bus journey to Jaguar’s stylish slice of the Silverhatten hotel complex on the edge of Arjeplog, we drop bags, hop in a fleet of winter-tyred Range Rovers and make a beeline for the company’s icy facility near a top-secret winter testing facility. 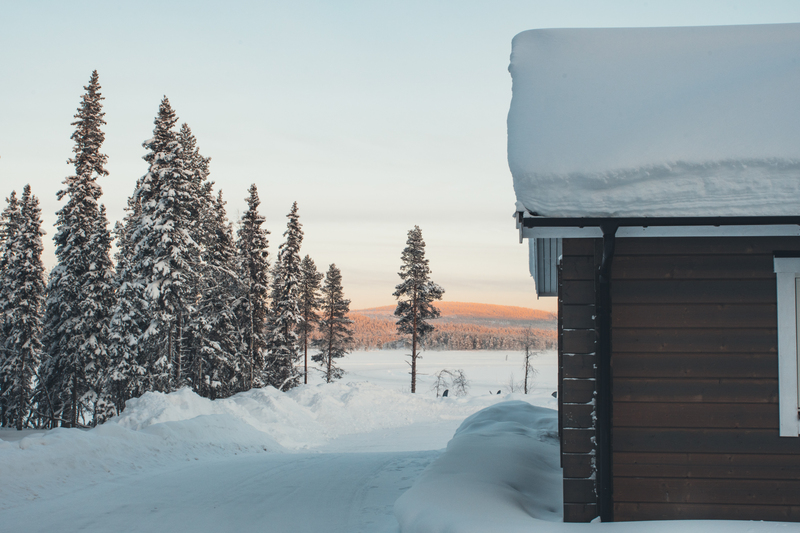 The place consists of a typically stylish log cabin (Jag knows how to do luxury, even in the wilderness) that sits at the edge of an expansive frozen landscape. Look out across the site and it feels as if you’re staring into a white abyss, only the light dusting of a few trees and distant mountaintops breaking the whiteout. 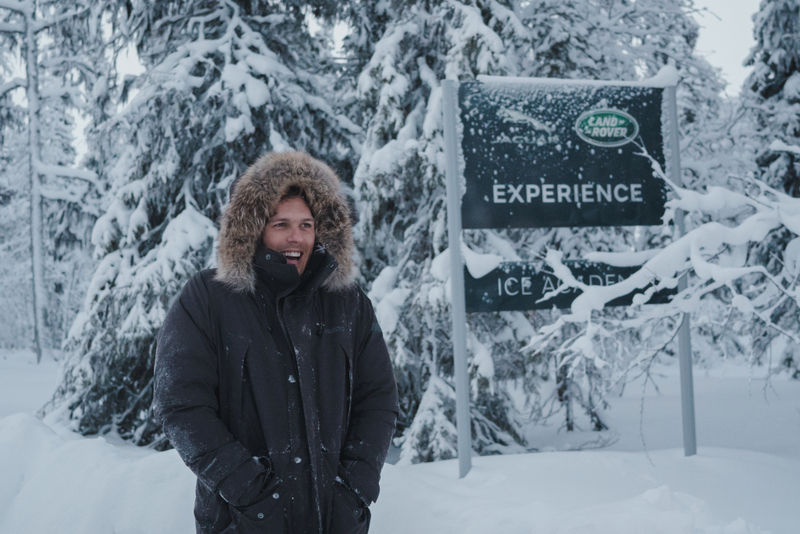 After a quick driver briefing, we creep onto the 24-inch-thick ice aboard heavy Range Rover Sports and tackle some of the most basic courses, which have been precision-carved into the frozen surface that morning by a dedicated team of ‘bashers’. Under the guidance of a couple of very handy ex-racing drivers, we start to get to grips with car control, allowing the rear end to step out and booting the throttle in order to control a slide. 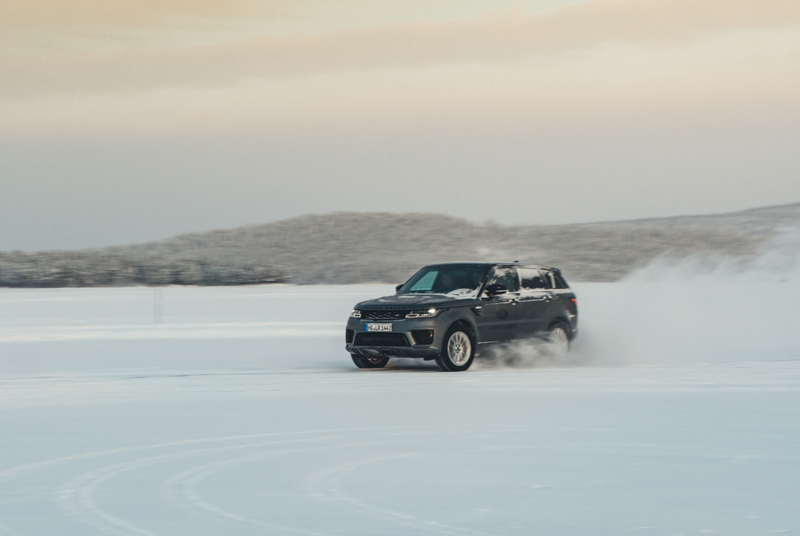 These enormous Range Rover products are fairly lumbering and slow, making them the perfect place to practice catching the drift, while the initial handling course consists of a few crude cones and very little to hit. But this is just the warm-up, because we are soon let loose in the smaller, more responsive F-Pace SUV, which is perfectly suited to tackle the trickier slalom and handling courses Jaguar offers. The facility covers around 110 square miles and features several circuits, drift circles and slalom courses, none of which are shared with anyone else. So it’s just you, the car and white for miles. 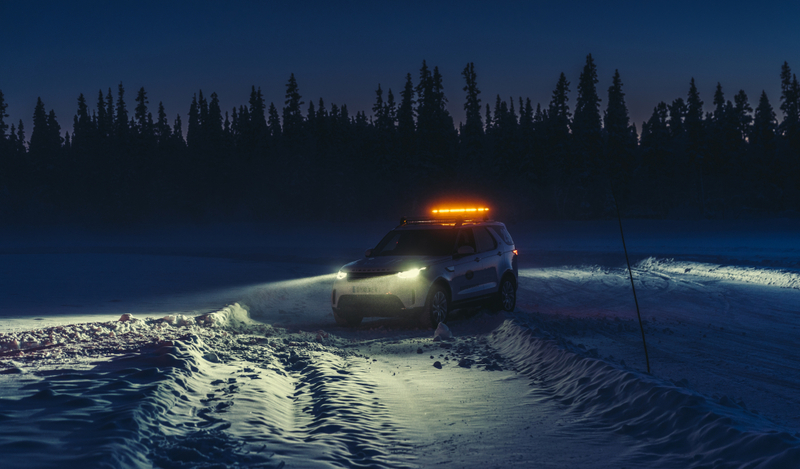 Just as I’m starting to master linking up drifts, the light begins to falter and even the beam of a powerful Bi-Xenon headlight can’t pierce the murky gloom that sets in when you are this close to the Arctic Circle. It is only 3pm and it’s almost time to call it a day. The final session is pure carnage, as the group runs out of light, energy and talent, the poor snow banks that surround this particular course are being ploughed to smithereens by the chunky steel snow guards, which are deliberately mounted to the front bumper of all vehicles out here. The session is a disaster, so we head back to the hotel for some warming comfort food (lots of reindeer, sorry vegans), a few celebratory beers (nobody died) and some much-needed sleep. 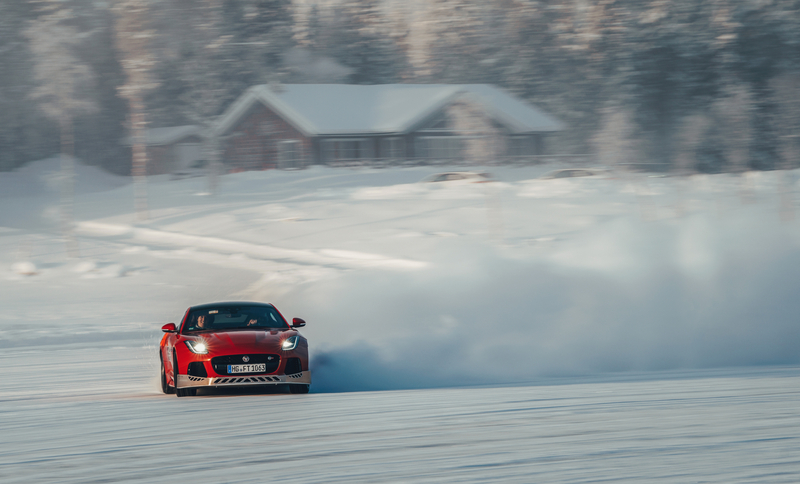 By the middle of day two, our expert instructors deem us competent enough to have a go in their V6, rear-wheel-drive F-Types, which we immediately take to the biggest snowy skidpan we can find and learn how this car behaves compared to previous machines. 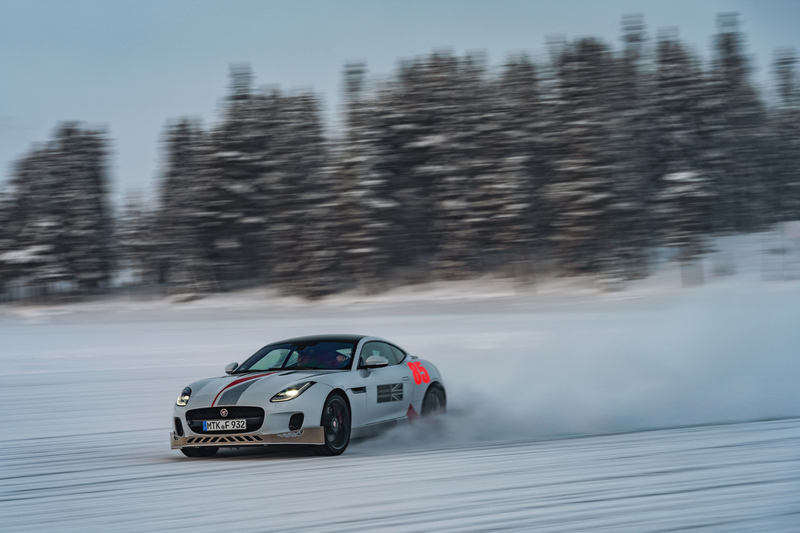 The brain has to rapidly learn a new form of car control, as this feisty little feline wants to spin into the nearest snow bank with any aggressive input of the throttle. Regardless, we are soon let loose on the tight and twisting slalom circuits to inflict yet more damage on these beautifully crafted courses. Step out of the car in the middle of the track and it’s possible to see large fissures appearing where the ice cracks and almost instantly refreezes due to the sheer cold. Those unlucky folk who have experienced big offs in the middle of the course reveal that the blanket of snow covering the lake’s surface is enough to insulate large puddles of water. That explains why there are so many wet trousers around. 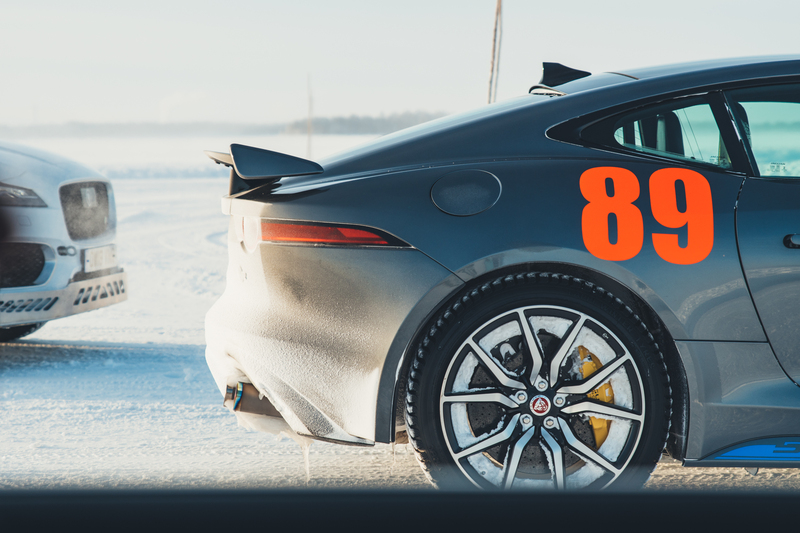 The day comes to a close as the sun loses its power prematurely but tomorrow we are promised keys to the big guns: the most potent, 567bhp F-Type SVR – a vehicle that is capable of 0-60mph in 3.5 seconds and a top speed that maxes out at over 200mph. There is a more serious tone to the final day, as everyone in the small group knows that the pace and power of our vehicles skyrocketed over night. As if to test our mettle, the instructors have also introduced a couple of larger, more complex circuits that allow for much greater top speeds but don’t suffer fools. Every vehicle on the complex is left idling, simply because they get too cold too quickly if left standing in these temperatures, so we don’t get to experience the ignition bark produced by those military-grade pipes. But it is not long before the SVR is hooked up and on the limiter, as we career around the massive oval skidpan at speeds of over 100mph. It is utterly mental. Brain-meltingly mad and the adrenaline hit reaches a dangerous level. With heart still firmly in mouth, we point the F-Type SVR towards one of the fastest circuits on the facility and spend the next hour or so careering into corners, leaning on the brakes, catching the rear and then allowing the awesome all-wheel-drive system to drag this beast into the next apex. It’s dangerously addictive. But like all of our days so far, it is over too soon, the light fades and we have to leave this magical complex behind. To think, there are engineers next door that get to do this for a living. The lucky devils. Fancy doing it yourself? 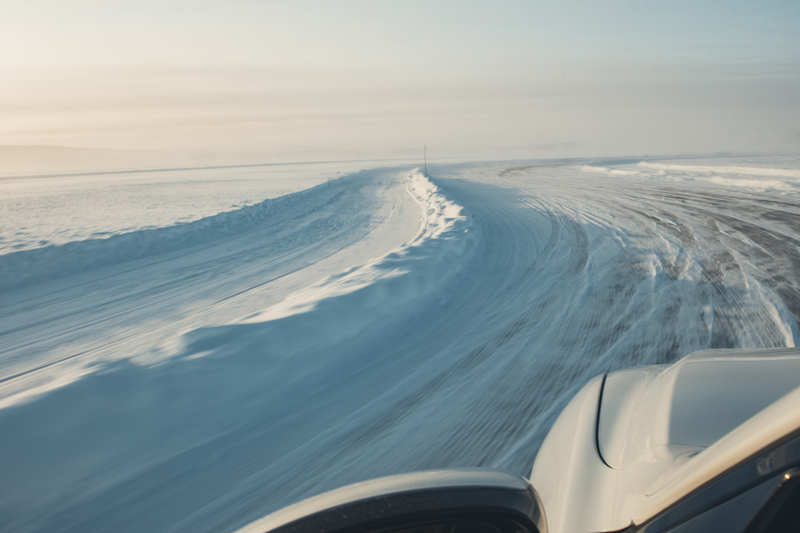 Jaguar offers a variety of ice driving experiences that start at around £3,500 and rapidly escalate depending on the length of stay, style of tuition and vehicles made available. 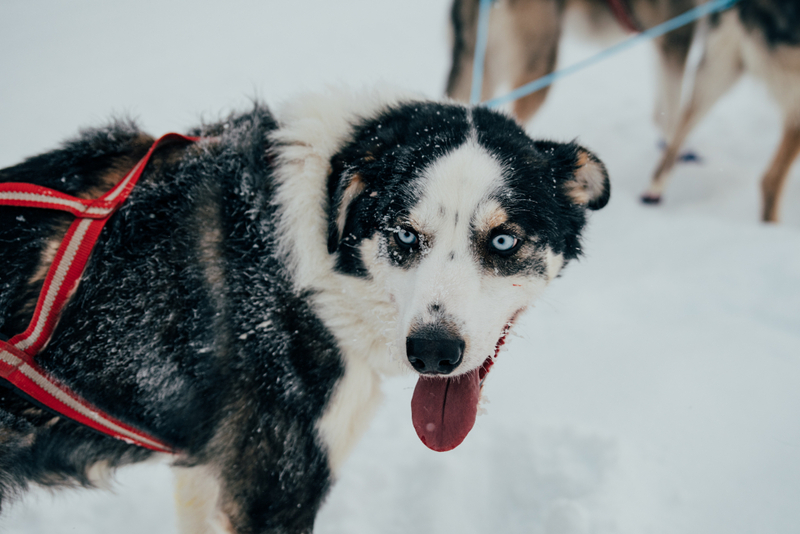 You’ll have to book your own flights but that includes tasty reindeer meals and a comfortable room. We didn’t say it was cheap, but it is bloody good fun. Check the website if you fancy treating yourself.